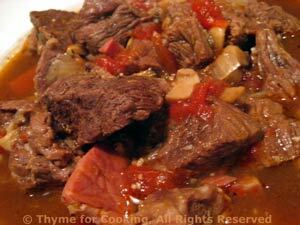 Braised Beef in White Wine and Tomatoes, easy dinner recipe. This is one of those long-cooking dishes that I love doing during the winter. It's not quite a stew and not quite a pasta. If possible, get 1 or 2 thick slices of dry-cured ham, like Prosciutto, from the meat counter. Cut beef into cubes 1 - 1 1/2" (3cm), and ham a bit smaller. Heat oil in Dutch oven or small soup pot over medium-high heat. Add onions, mushroom and garlic and sauté until starting to brown, about 5 minutes. Add ham and beef and sauté, stirring, until all pieces are starting to brown. Roughly chop tomatoes and add to pot, along with the juices. Add wine, herbs, nutmeg and bring to a boil. Reduce heat to a slow simmer (small bubbles just breaking the surface), cover and let cook for 2 - 3 hours. Cook pasta according to package directions, just until al dente. Drain and immediately return to pan to low heat. Add 1 cup of the sauce from the beef (but no meat) and stir to combine and heat through. Arrange the pasta on a small platter or two plates. Remove bay leaves. 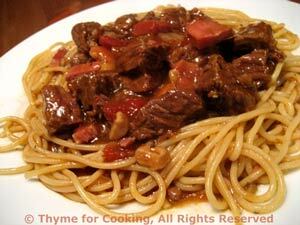 Spoon some beef and ham on top or the pasta and serve. Note: This serves 4 as is. For two meals for two: cook half the pasta for each meal or cook it all at once and reheat the remaining half for the second meal by running hot tap water over it.